Put on your Red AFA pin. Members should not be speaking to the press. Only the designated spokesperson for your location has authorization. Media can be directed to press@afanet.org or 202-550-5520. Denver Outside of DENSW 11:00 a.m. - 4:00 p.m. Day of Information: Q&A, negotiations information and more. (Located above Arrivals Area.) Session 1: 2:00 - 3:30 p.m.
Las Vegas, NV 89102 3:00 p.m. - 4:00 p.m. Meet and Greet with Contract update and Q & A. South Ealing, London, W5 4UB 12:30 p.m. - 2:30 p.m. Informational meeting and discussion. Please RSVP by 12noon on April 20. Los Angeles LAX Terminal 7 - Departures 11:00 a.m. - 12:30 p.m.
(Briefing at 10:30 a.m.) Informational Picketing with Teamsters. Please attend in full uniform with AFA pin. New York Newark Airport - Terminal C - Upper Level Door 5 2:00 - 3:00 p.m.
(Briefing at 1:30 p.m.) Please attend in full uniform with AFA pin. Family and friends welcome. San Francisco Departure Level, United Terminal 3, SFO Airport 10:30 a.m. - 11:30 a.m.
(Briefing at 10:00 a.m.) Informational Picketing. Please attend in full uniform with AFA pin. Washington, D.C. IAD Departure Level, Outside United Ticket Counters 2:00 - 4:00 p.m.
(Briefing at 1:45 p.m.) Informational Picketing. Please attend in full uniform with AFA pin. 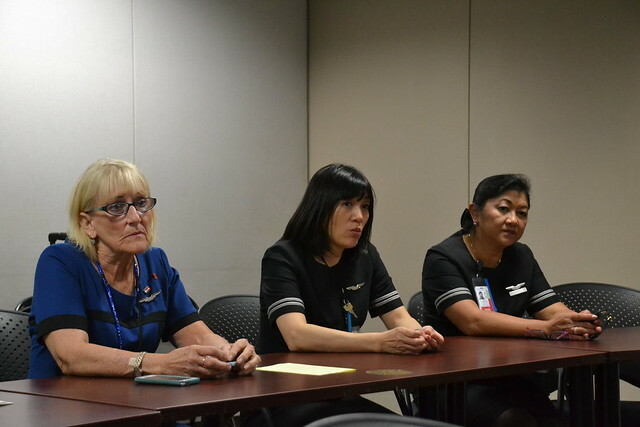 Every Flight Attendant can send a powerful message to United management: We are united in our resolve to reach a fair Contract, and Flight Attendants are not going to pay for this merger. United Airlines is making record profits. In 2015 United will see income 5X higher than in 2013. United's operating profit in 2015 - 2017 is expected to be $5 billion or more for each year. Top executives and shareholders are cashing in. United's stock price is up 204% since negotiations began. United has $7.0 Billion in Cash on its balance sheet. United just announced it is investing $100 million in a Brazilian airline (but it can't invest in us, the frontline workers who spend more time with passengers than anyone else). United Airlines is doing well. These are not concessionary negotiations. These negotiations are about putting three work groups together to complete this merger and move United forward. It's been three years, and it's been long enough. It's Our Turn and It's Past Time. Most Flight Attendants were here long before the merger was announced in 2010. All of us have made sacrifices, at all three airlines, to pave way for the success United enjoys today. Since 2010 new hires have joined our ranks and, just like us, they are having to manage the challenges of a merger that management cannot seem to complete. This merger is working for executives and shareholders. It needs to work for all United Flight Attendants too! As we have previously reported in our JNC updates, progress at negotiations has ground to a halt in recent months. Unlike the company's rosy communications of recent weeks, the parties are far apart on key issues. The bottom line problem is the company's unwillingness to put the required economic resources into a Flight Attendant Contract. That is unacceptable and the JNC needs each of you to stand with us to make it clear to the company that we expect much more, especially now as the profits soar. The JNC is unanimous in calling on all Flight Attendants to demonstrate our solidarity. On July 16th, across the system, we will conduct a system-wide Day of Action. We will stand shoulder-to-shoulder for a joint Contract that recognizes and respects what each of us brought to this merger and the hard work all of us do for United Airlines today. Our airline's future depends on completing this merger. Even though United has clearly benefited from the airline industry's consolidation, UAL total stock value lags other large network carriers by 50% or more due to its weak operational performance when compared to American and Delta. The media and business press have repeatedly raised concerns about United's operational problems. At the core of United's problems is the failure to finalize our Contract and realize the full potential of this merger. Make no mistake; United can afford a Flight Attendant Contract that values our contributions to the success of this airline. The problem is not the ability to pay; it is the willingness to pay. Management at United Airlines has been hearing from the JNC for three years, they need to hear from you too. Every United Flight Attendant can send a powerful message to United management: We are united in our resolve to reach a fair Contract, and Flight Attendants are not going to pay for this merger. It does not matter whether we come from pre-merger CAL, CMI or UAL. It does not matter if we are based in Newark, Chicago, Hong Kong, Guam or anywhere else; we must all be recognized for our contributions to United Airlines' success.